April 7, 2014: Lee Byung Hun in "The Insiders"
Lee Byung Hun in "The Insiders"
Actor Lee Byung Hun is starring in the new movie "The Insiders" based on the original web-toon by Yoon Tae-ho. Directed by Woo Min-ho, this movie takes a look at the corruption and irregularity rooted deep in the Korean society. Lee Byung Hun takes on the role of Ahn Sang-goo, a political gangster who falls to the ground after doing all the chores the higher ranking and deciding revenge against them. The actor is an international star who has starred in Hollywood blockbusters such as "G.I.Joe 2", "RED: The Legend" and more. He's expected to play a character unlike the ones he's done so far. Lee Byung-hun had chosen his next work. Production Company of ‘Insiders’ announced that he will be in this movie. It is based on the web-toon of Yoon Tae Ho who is well-known as the writer of ‘Moss’ and ‘Incomplete life’ and Woo Min Ho will direct this film. It is the story about the Korean modern and contemporary history. 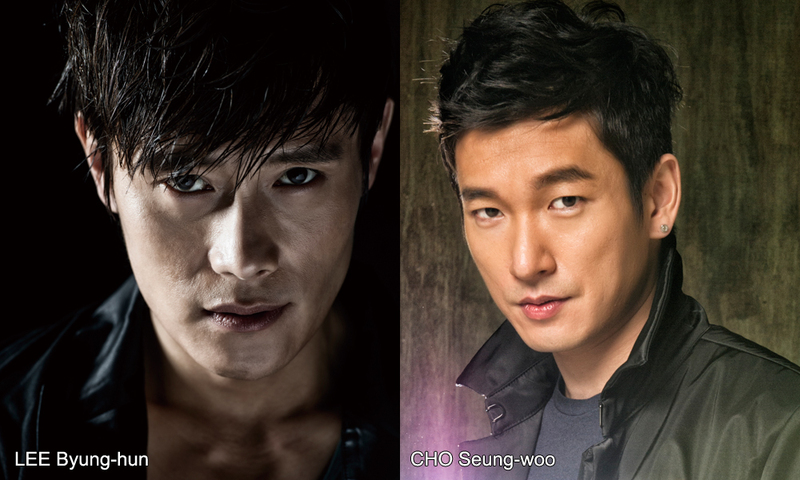 Lee Byung Hun will take the part of Ahn Sang Gu, the gang who is planning to revenge. Actor Lee Byung Hun has been cast in a new movie directed by Woo Min Ho and written by Yoon Tae Ho called 'Insiders.' He will be playing the 'political gangster' Ahn Sang Goo in the movie, which is based on a web-toon of the same name. The movie focuses on the decay and corruption deeply rooted in Korean society through a sharp dissection of "inside people." Lee Byung Hun's character, Ahn Sang Goo, will play one of those corrupt people, who then become bent on revenge after his life comes to ruin. They will begin filming in July for a premiere in the first half of 2015! According to local reports, Lee is also slated to join the new webtoon-based movie “The Insiders” (working title). The film is based on the webtoon of the same name by star cartoonist Yoon Tae-ho, famous for “Moss” and “Incomplete Life,” which were also adapted into movies. “The Insiders” takes a look at deep-rooted political and social graft in Korean society from an insider’s perspective. Lee will star as the political hoodlum Sang-goo, who carries out an array of underhanded schemes for corrupt politicians but plots his revenge after his downfall. The movie is set to be directed by Woo Min-ho, of “Man of Vendetta” (2010). Shooting will kick off in July, with the film scheduled for release in the first half of 2015. Fresh off news that he will be featured in the upcoming Hollywood blockbuster Terminator: Genesis, Korean actor LEE Byung-hun has signed on to a new local production called Insiders. Based on the webcomic ‘Naeboojadul,’ Insiders will feature LEE as a shady character who operates within the halls of powers, doing dirty work for crooked politicians. When the tables are turned on him and his reputation is ruined, he sets out to get his revenge. The film will be the third directed by WOO Min-ho, following his revenge drama Man of Vendetta (2010) and North Korean spy thriller The Spies (2012). WOO previously used KIM Myung-min as is leading man of choice and is now looking to broaden his horizons with what will surely be a larger project. LEE is a big star at home, having appeared in films such as A Bittersweet Life (2005) and Masquerade (2012), not to mention many TV dramas, but also a large presence overseas, by dint of his roles in Hollywood fare such as the G.I. Joe films and RED 2. Already the most popular Korean movie star overseas, LEE is set to increase his exposre in the west through his upcoming role in Terminator: Genesis. He will next be seen alongside JEON Do-yeon and KIM Go-eun in period epci Memories of the Sword later this year. 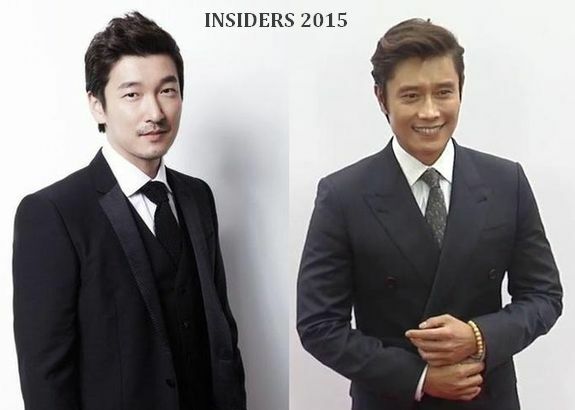 Actor Jo Seung Woo confirmed his role in the most expected movie of 2015, "The Insiders." He is going to star in the movie as the prosecutor Woo Jang Hoon. Directed by filmmaker Woo Min Ho, "The Insiders" is based on the web cartoon of the same name by Yoon Tae Ho, who also wrote and drew the popular web cartoons "Mi Sang" and "Moss." In the film, actor Jo Seung Woo plays prosecutor Woo Jang Hoon, who uncovers bribery o the politicians. He is going to film with actor Lee Byung Hun, who plays the role of Ahn Sang Goo, the gang member who works for politicians. The film "The Insiders" team will start filming this summer, and premiere early next year. LBH + JSW = wow .... simply wow! Jo Seung Woo has recently confirmed that he will star in a highly anticipated thriller ‘The Insiders’ with Lee Byung Hun. The film is based on a webtoon by Yoon Tae Ho, whom I believe will also pen the script, and focuses on the corruption in Korean politics. Jo will play Prosecutor Woo Jang Hoon who uncovers the corrupt world of politicians and finds himself going up against Ahn Sang Gu (Lee Byung Hun), an ‘inside man’/gangster who manipulates and is heavily involved in the bribery amongst politicians. When Sang Gu goes down, he plots for his revenge. It’s likely his character will be up against Prosecutor Woo but then they could join forces at some point too. The film will be directed by Woo Min Ho, who previously directed both ‘Spy’ and ‘Man of Vendetta’ with Kim Myung Min. I would almost not be surprised if Kim Myung Min gets involved in some way now. Maybe he can be a politician who gets involved in Jo’s investigations! The film is set to start production this summer and be released in the first half of 2015. In the meantime, Jo Seung Woo is in the musical Hedwig and the Angry Inch (which he started right after finishing God’s Gift 14 Days) and Lee Byung Hun is on his various movie projects for Korea and Hollywood. The highly anticipated Korean movie 'Insiders' is amping up the excitement with its star studded cast. It already confirmed Lee Byung Hun as the 'political gangster' Ahn Sang Goo and now has added Jo Seung Woo to the line up. 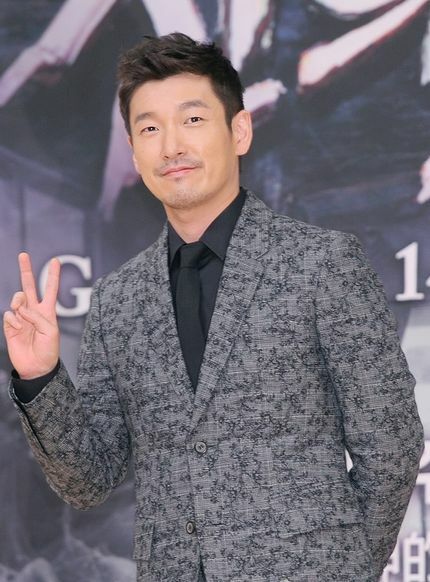 Jo Seung Woo, who most recently garnered a lot of attention for his performance in drama 'God's Gift - 14 Days', will be playing Prosecutor Woo Jang Hoon, who goes after corrupt politicians. This will be his first comeback to the big screen in two years. The movie, based on a webtoon of the same name, will be directed by Woo Min Ho and premiere in the first half of 2015. It's still a long way off, but wait patiently if you can! Cho Seung Woo decided to cast in a new film called 'Insiders'. On June 3rd, the production agency of movie 'Insiders' told that Cho Seung Woo has confirmed his casting. 'Insiders' is a film that was motivated from an online comic strip of the same title, and director Woo Min Ho is going to undertake the charge of a director. The film is going to show a story about corruption and conspiracy that is deeply embedded in Korean society, and Cho Seung Woo is going to cast as a detective named Woo Jang Hoon. 'Insiders' became a hot issue as Lee Byung Heon has announced his casting a while ago, and fans' excitement is now reaching its zenith. Meanwhile, 'Insiders' will be officially released in early 2015. Jo Seung-woo to star in movie "The Insiders"
Jo Seung-woo is joining the movie "The Insiders" with Lee Byeong-Heon. "The Insiders" is based on the original web-toon by Yoon Tae-ho. Directed by Woo Min-ho from "Man of Vendetta", "The Insiders" is about the corruption of the Korean society. Jo Seung-woo takes on the role of prosecutor named Woo Jang-hoon and Lee Byeong-Heon is a gangster named Ahn Sang-goo. "The Insiders" will be released in 2015. Actor Jo Seung-woo confirmed he will appear in the film “The Insiders” alongside actor Lee Byung-hun, according to the movie’s distributor Showbox yesterday. 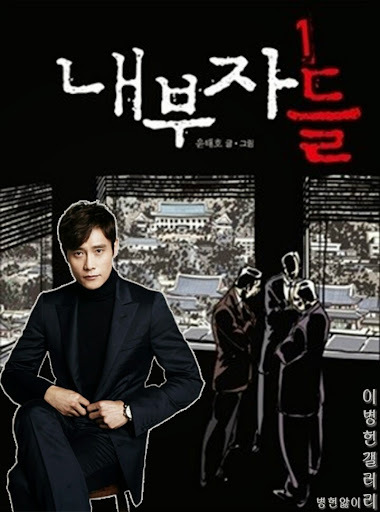 “The Insiders” is based on a webtoon of the same title by celebrity artist Yoon Tae-ho, which focuses on all sorts of corruption in Korean society. Director Woo Min-ho of “Man of Vendetta” (2010) is taking the helm. Jo will play prosecutor Jang-hoon, who takes strong action against corrupt politicians. 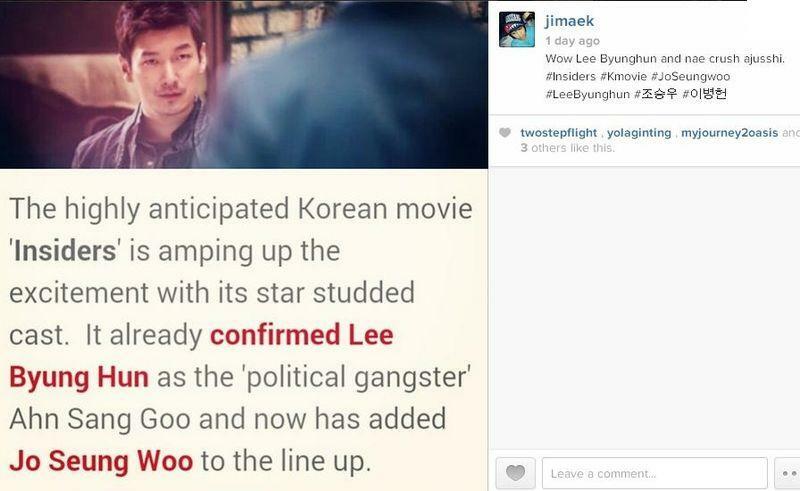 Lee will play Jo’s counterpart, Sang-goo, a political hoodlum. The film will start shooting this summer and aims to get its release early next year. Well I’m suddenly very interested in this movie. Lee Byung-heon (RED: The Legend, Masquerade) will be starring in the dark political thriller Insiders, and Jo Seung-woo (God’s Gift-14 Days) has just signed on to join him. That’s a hell of a match-up from two very charismatic actors; plus, there’s so much pretty, I don’t know where to look. The movie is an adaption based on the webtoon Insiders from star writer Yoon Tae-ho (Misaeng, Moss), and will be directed by Woo Min-ho (Spies). The story is about the movers and shakers behind political corruption, in particular shedding light on how deep the corruption goes in all facets of society. Lee Byung-heon plays the gangster employed by crooked politicians to do all their dirty work, and Jo Seung-woo has been cast to play a prosecutor who bends over when told to bend over, and covers up what he’s told to cover up. He’s described as the “corrupt politician’s sniper,” and I’ve seen enough dramas to believe that a prosecutor really is the best weapon that evil people in power could have. I guess two full dramas spent being a good guy means it’s time for Jo Seung-woo to flex his bad boy movie muscles again. I won’t complain, but after… more dramas, right? Insiders starts shooting this summer for a release next year. Jo Seung Woo And Lee Byung Hun Cast Together? 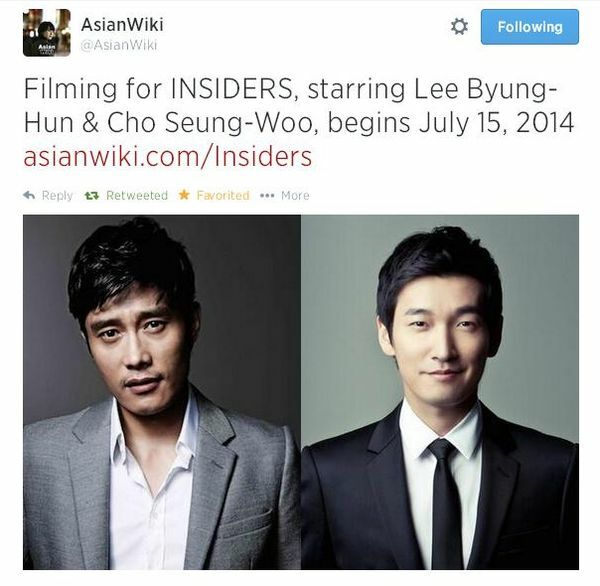 Actor Jo Seung Woo (34 years old) and Lee Byung Hun (44 years old) will be in the movie "Insiders" (director Woo Min Ho) and collaborating. According to the distributor Showbox on June 4th, Jo Seung Woo and Lee Byung Hun have been confirmed as protagonists in the movie "Insiders." "Insiders" is a movie with the original webtoon piece writer Yoon Tae Ho's piece as the inspiring piece. The movie is grounded in our society and reports on the most deepest sides of our society and the corruption of that needs to be reported. In the movie, Jo Seung Woo plays the role of prosecutor Woo Jang Hoon who is the main character of a corrupt politican. Lee Byung Hun is the role of a political gang member Ahn Sang Goo. At the meeting between two great actors, netizens have been showing great expectations from the get go. Netizens said, "Jo Seung Woo is the prosecutor, Lee Byung Hun is the gang so how new." "I'm so curious about the content and I want to watch this." "Jo Seung Woo's movie is something that I haven't seen in a while." "I look forward to this" and showed resposnes. The movie will be cranking in this summer with the goal to be released next year. CHO Seung-woo (Tazza: The High Rollers, 2006) has been confirmed to star in The Insiders, said Showbox/Mediaplex Inc. on June 6th. CHO will be cast as a public prosecutor who works against corrupt politicians. Director of Man of Vendetta (2010) WOO Min-ho will be taking the speakerphone for The Insiders which is based on a webtoon by YOON Tae-ho. The work will dissect the corruption within Korean society. CHO will play the heroic public prosecutor named WOO Jang-hoon who will fight against the politicians who demand law to be bent for their benefit. 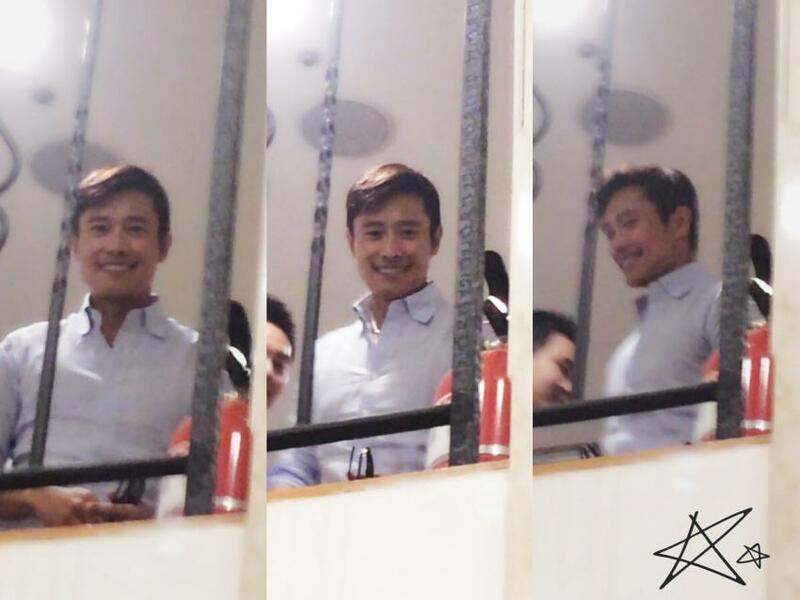 CHO has received critical acclaim not only through film and TV series, but also from the world of musicals. It is his first feature in two years following The Peachtree (2012). A gang member with political power, AHN Sang-goo, will be played by LEE Byung-hun. The chemistry between the two actors is highly anticipated. The Insiders will crank in during this summer and will release in theatres early 2015. Not directly about 'The Insiders' but background info & mentions related to the webtoon writer..
On a bustling subway ride to work, it’s not hard to find people staring into their smartphones or PC tablets, scrolling quickly down the screen to see what comes next. On sidewalks or in coffee shops, the situation is the same. If a smile can be spotted on the user’s face, it wouldn’t be far-fetched to say they could be reading one of their favorite webtoons, a term coined in the early 2000s combining “web” and “cartoon,” which describes comic strips distributed online. The competitiveness of webtoons, compared with other entertainment content, has increased greatly with the rise of smartphones. And with the number of people using smartphones proliferating exponentially, webtoons’ future seems more promising still. According to the international research institute Strategic Analytics, the penetration rate of smartphones in Korea surpassed 67.6 percent in 2012 and is expected to reach 79.5 percent in 2013. This means that eight out of 10 people have free access to the Internet - anytime, anywhere. Other major markets in the world also easily reach more than 50 percent in terms of smartphone possession, which means there is much more of a possibility for online cartoons to surge on a global stage. In order to cater to the recent webtoon boom, the National Library of Korea has opened a three-month exhibition that exclusively treats issues related to online cartoons. “All Webtoon” displays the history of Internet comics and memorable works, details the process of creating a webtoon and also gives opportunities to meet celebrity webtoon artists. The show runs through Aug. 24. “It was hard to imagine the globalization of the webtoon before smartphones came on the scene,” said Park In-ha, a professor of comic creations at Chungkang College of Cultural Industries during the “All Webtoon” press tour on May 26. “The supply of smartphones acted as a vital role in expanding the webtoon industry with it enabling daily access to the Internet. Traffic from smartphone users is three times more than that of PCs,” the professor said. In response to the increased number of smartphone users, Naver launched a new webtoon service called “Smart Toon,” optimized to show a single panel of the comic instead of the whole strip, which adjusts to fit the smartphone screen fully. Rather than scrolling down the screen, a slight swipe shifts the comic to the next panel. When “Smart Toon” was first introduced two years ago, people compared it with TV’s evolution from analog to digital. Moreover, with the development of technology, Naver lets artists experiment with new special effects, mainly in its omnibus horror or sci-fi series every summer. Using effects such as moving images and the sudden appearance of ghostly characters onscreen, these horror webtoons become all the more dramatic when read on smartphones. 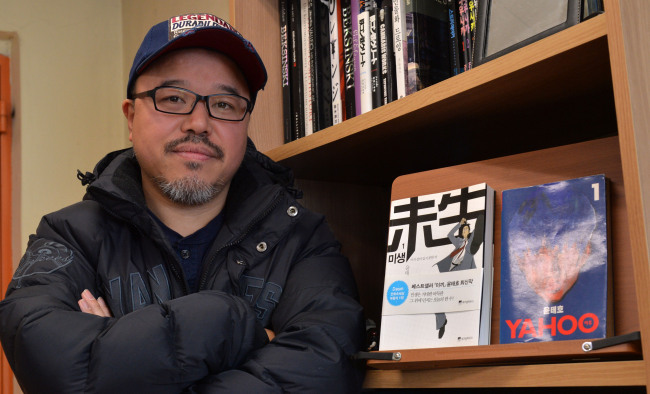 The history of webtoons goes back 10 years to when cartoonist Kang Full, one of the early artists of webtoons, started to upload his work on a personal homepage in 2002. When Korea’s major portal sites like Daum and Naver launched webtoon services in 2003 and 2005, respectively, artists were given more platforms to introduce their drawings. For example, Kang’s “Love Story,” which gained popularity when it was published on Daum in 2003, reached a milestone when it attracted two million viewers in a single day. Soon after, webtoon moguls like Kang, Cho Suk, Ha Il-kwon and Yoon Tae-ho, who are so-called celebrity webtoon artists, were introduced to the business. “The content for webtoons gradually built up over the years, between 2008 and 2009. And everything came together and started to explosively gain popularity after 2010 when smartphones came in handy,” said Professor Park. As the industry flourished, the webtoon content landscape began to change, too. Early artists like Kang Full and Yoon Tae-ho kept the traditional cartoon’s narrative format, where each episode is chronologically and emotionally connected until it ends. But with the number of content makers proliferating, more genres were created to better suit readers’ tastes. And for that matter, focusing on a point of climax or having a concrete conclusion didn’t seem to matter that much. For example, Cho Suk’s popular webtoon “Voice Within,” launched in 2006, generally deals with incidents from our daily lives, but each episode is completely separate from one another. This has become one of the strong points of Cho’s webtoon because newcomers can jump in anywhere and begin reading the series. “I like episodic or omnibus-style webtoons because I don’t read webtoons expecting some great storyline or deep message. It sometimes feels like work for me, thinking that I have to go back some hundreds of episode to keep up with the recent one,” said Kim Bum-joo, 27, an enthusiastic webtoon reader. Likewise, with versatile genres from romance to sci-fi undertaking different themes like cooking, marriage and sports, readers are provided with tailored webtoons. As a result of continuous content development, Naver, which started as a one-person service in 2005 with three series, now attracts an average of 17 million visitors per month with 200 webtoon artists producing more than 156 cartoons every week. Recognition of webtoons as mainstream content owes a lot to their adaptation into various types of media. From animation and games to movies and musicals, webtoons’ storylines have become stepping-stones to provide characters, concepts and scripts for numerous forms of entertainment culture, luring diverse fans. The adaptation of webtoons into movies started with Kang Full’s “Apartment” in 2006. But its potential as a full-fledged synopsis was taken into notice with Yoon Tae-ho’s “Moss,” when it was made into a feature-length film in 2010 and attracted nearly 3.5 million moviegoers. Later, Hun’s “Secretly, Greatly,” starring heartthrob Kim Soo-hyun, also achieved huge box-office success, pulling in seven million viewers. Dramas and even comedy shows have also dived into webtoons in search of inspiration. The “Lee Mal-nyun Series” is a representative webtoon work that boasts absurdness as its strongest feature. It mostly became acknowledged after the advent of smartphones. Its rough sketches, crude conversations and ridiculous storylines are just about enough to catch readers’ attention while they look for something to keep them amused on public transport. At the London Book Fair in April, Naver exhibited webtoons translated in English, for the first time in 43 years of the international fair’s history. One of Naver’s longest series, “Noblesse” by Son Je-ho, is ranked No. 1 on global “scanlations” - or scanning, translation and editing - on the website mangafox.com among hundreds of Japanese manga that have long been popular in the Western cartoon industry. Another Naver webtoon “What Do the Teenager Boys Do,” drawn by Cutbu, which is popular for its use of toilet humor, is translated by individual interpreters and shared by international fans. Some fans even upload short videos of each episode dubbed in English or Spanish on YouTube. To take advantage of global interest, Naver aims to launch Line Webtoon using its mobile messenger Line, to provide about 40 webtoons translated into English and Chinese. “Although it will take considerable time for webtoons to settle as one of the major genres of cultural content, we are going to approach the public step by step” said Naver’s Kim. Daum, another prominent webtoon platform, partnered with Tapastic Media, owner of North America’s first online portal for web comics, tapastic.com to export Korea’s webtoons abroad. They are planning to cooperate to make original webtoons, in addition to translating Daum’s content. “One of the key points to webtoon’s success in Korea was its convenience. The fact that people can easily access it despite their whereabouts [was really important],” said Professor Park. Veteran actor Baek Yoon Sik (The Taste of Money, Tazza) is the latest addition to the upcoming movie 'The Insiders'. He will play the character of a conservative newspaper columnist. There have been highlights on twitter that today 06/15 (Sunday), the star couple Lee Byung Hun and Lee Min Jung were spotted attending Jo Seung Woo's musical play 'HEDWIG'. Lee Byung Hnn will be collaborating with Jo Seung Woo in the upcoming movie 'The Insiders' which will start filming in July. The webtoon-based movie has been tentatively set for release early 2015. "Insiders" first shooting on July 15th..."casting LBH, it's unrealistic"
The upcoming movie 'The Insiders' will start shooting July 15th, according to ShowBox. Yoon Tae Ho who is the original webtoon writer said when he heard about Lee Byung Hun starring in the movie, he didn't expect such a busy actor would do this when production company said they were considering the actor. To the writer, it still feels unrealistic that LBH is really doing it. He also said that he thinks the voice is an important aspect of an actor, and LBH's voice is a fantastic feature for the actor.